As Norway had compulsory enlistment, all sailors were naturally interesting subjects for service in the Navy. The government needed to keep records of all sailors, so that they could be drafted for service in case of war. The "War Ministry" (Krigsdepartementet) divided the country in to enlistment districts (DISTRIKT). At first there were 7 districts, but from 1859 this was reduced to 6, in each district there would be District Registrar. The districts were divided in several circuits (KRETS), and in each circuit there would be a registrar clerk keeping records of the sailors. This arrangement lasted till 1911. These records ar most often found catalogued under the Military records. 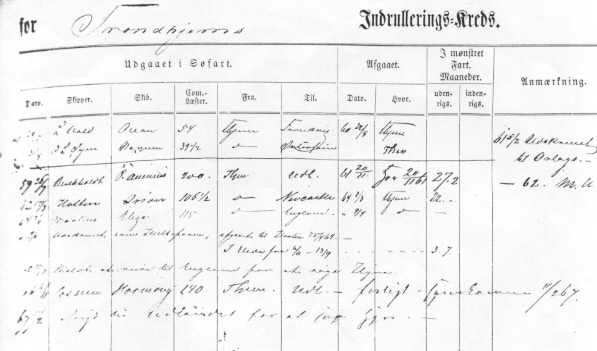 After 1911 a new kind of record were kept, called "Sjømannsregister", which was a civilian office of registration and mustering. It was organized under the "Department for Trade and Shipping" (Departementet for Handel og Skipsfart). From 1911 there were 6 districts. The registers have now become our most valuable source for finding information about Norwegian sailors. It was quite common for Norwegian sailors to start their career by going out to sea at the age of 15 - 16. These youngsters who were selected for the Navy would be registered in special records called the Sjøfartsannotasjonsruller" (Annotasjons-Rulle). When becoming (halvbefaren) "ordinary seaman", after one year in foreign waters, or at the age of 22, they would be transferred to the "Sjøfartshovedrulle". Durig their career as sailors people were often drafted several times to serve in the Navy. The records from the period from 1704 and till about 1860 are of a different character than the later rolls, and content vary much. For many areas you will not find any records from that period, but from 1860 most areas are covered. The records are most detailed between 1860 and 1911. The "Annotiasjonsrulle" was where the young men would be listed after they had been inspected by the military board. Those who were sailors then received a temporary "Patent". Also sailors who had sailed in foreign waters for at least 1 year after they reached the age of 15 would be listed. Sailors which did for some reason did not get a temporary patent would be listed in this record, but only till they reached the age of 22. When a sailor achieved the rank of "ordinary sailor" he would receive his "Patent" and be transferred to the "Hovedrulle"
The "Sjøfartshovedrulle" is a most valuable record, as there was noted information about the personal history and career of the sailors. You will find name, residence, date of birth (and death), date of sailors patent issue, dates of advancement in rank as from "ordinary sailor" to "able seaman" (fuldbefaren or matros), to "mate" to "1st mate" etc.) Note that when someone advanced from seaman to mate, they would often be transferred to a new record specially for mates, called "Styrmansrulle". There are also special records for Captains called "Kapteinsrulle" or "Skipperrulle". In many cases Captains and Mates were listed in the same roll "Skipper og Styrmansrulle"
The records contain information about the sailor's engagements, destinations, name of ships, length of each journey and so on. To say it simple - in these records one will find a detailed description of the persons career as a sailor and merchant marine officer. You will also find notes about sailors that abandoned (jumped ship) their ships in foreign ports, and about deaths. Some times one will find that a sailor is noted as leaving on a ship bound for a foreign port, then there will be no notice for several years, before the ship returns to the home port again. In such cases it is possible to reconstruct the voyage by checking the maritime intelligence column in the local newspapers. Telegrams and rumors about the whereabouts of the ships were printed regularly. The images shows an example of the Hovedsjøfartsrulle of Trondheim. Johan Richard Solem was my gggrandfather. Lets take a look at the above scan first. 8th column (Overgang fra Annotasjon-Rullen, opnaaet Frihed for Værnepligt naar og Hvorfor) Reference to the transfer from the Annotasjons-rulle (youngsters record), and information about immunity from service. From the information given in these records, I was able to reconstruct much of my gggrandfather Richard's life as a mariner. By searching the merchant marine intelligence column in the local newspaper, I was able to gather more information about the ships, where they sailed, their cargo and incidents they were involved in. Then from the local Maritime museums I was able to get pictures, and other valuable information concerning the ships. I even found the captains account from the first ship Richard sailed on from Trondhjem. 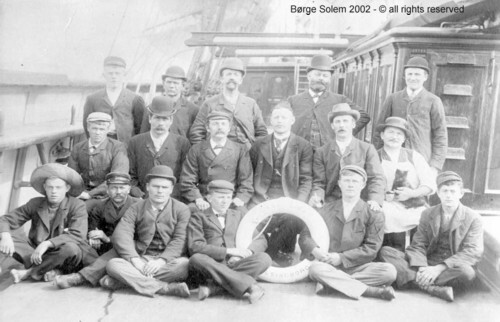 Quite a number of Norwegian sailors abandoned their ships to become immigrants. They will not be listed in the Norwegian emigration records, or on any passenger list, so these records can often be valuable as a second choice, after searching passengers lists without any luck. To find people in these sources you need to know where they lived, as there were separate records for the different districts. The records are now kept by the National Archives, or "Statsarkiv". There are several "Statsarkiv"s, holding records from their respective districts. Only a small part of the records has been microfilmed. To do research in these records, you will in most cases have to go to Norway, or get someone in Norway to do the research for you. The records are not easy to work with, and it can be time consuming as there are usually no indexes (registers) of names. Names were entered in the books as the sailors appeared at the office to register. However, the records them selves are to some extent cataloged by the respective archives keeping them. Usually they will send you a copy of the pages in the catalog covering the records you ask for. It is often necessary to order the records in advance. If you just show up at the archives without ordering in advance, you might not be able to access the records. A typical crew of a sailing ship (bark rigged) which usually consisted of 16-17 men, the captain included. The crew on those ships would typically contain a captain, a 1st mate, 2nd mate, boatswain, shipscarpenter, coock, 9-10 able and ordinary seamen, and the "boy" (rookiie).